A complete color chart accompanies the calibrated test strips. As single use devices, they are completely maintenance free. For careful testing of dangerous, poisonous or aggressive liquids, the strips have the optimal design. 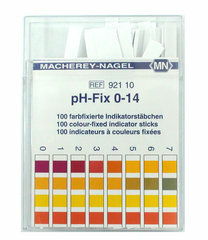 The dye is fixed to the test strip and can not bleed into the sample. This protects the sample against contamination and enables measurements in weakly buffered or strongly alkaline solutions. pH-Fix test strips feature up to four different indicator pads to cover the complete pH range. The color chart exactly matches both color and position of the pads on the strips. This enables highly precise pH-determination and makes the test strips rapid and reliable. My Opinion: It does exactly what she described on her website. I specifically like the fact that the colors of the strips do not bleed into the products I am testing. The strips are also small enough to be inserted into the mouth of most bottles. I will definitely buy again as I have to knoe the PH of the products I am putting in my hair.